H. G. Wells’ groundbreaking 19th Century science fiction novel The War of the Worlds is fascinating, not only in itself, but just as much because of all the adaptations and sequels it has spawned. Not only has it resulted in six feature films (the 1953 version is a classic), an infamous TV series, an amazing music album by Jeff Wayne and countless comic adaptations. Perhaps most well-known of all is the 1938 radio dramatization by Orson Welles, an adaptation that allegedly created mass panic (historical consensus nowadays seems to be that it was not quite as bad as all that). Today is the 79th anniversary of that broadcast. Panic or no panic, the radio drama, together with the events following, has itself been adapted on numerous occasions. Perhaps the first such adaptation was an episode of the CBS TV series Studio One, titled The Night America Trembled. After a brief introduction, the episode begins with a car racing along a deserted highway. We hear the radio. A voice is talking about the ongoing invasion. The car takes another bend, but too fast. A crash, then everything goes silent. All we see is a spinning wheel. Through the rest of the episode, we get to follow a number of different people. We see and hear their reactions, and we also get to follow important events in their lives, as they play out to the background of, and sometimes augmented by, the radio. The cast of this adaptation of an adaptation contains several young actors who would later rise to various levels of fame, not least Warren Beatty and James Coburn. Orson Welles, who both directed and played the main character in the original play, is here played by Robert Blackburn. However, Welles is not once mentioned by name. In addition to The Night America Trembled, the Internet Archive contains several interesting subjects connected to The War of the Worlds, although not so many on film. A short selection: The original novel The War of the Worlds is a must read; there is also a LibriVox recording. Edison’s Conquest of Mars was one of the first sequels, though truth be told it is a pretty terrible read; again there is a LibriVox recording. Mercury Theatre on the Air: The War of the Worlds is Orson Welles’ original radio play, well worth listening to, and a Universal Studios newsreel from the day after contains some snippets from a press conference with Orson Welles; in itself a classic. 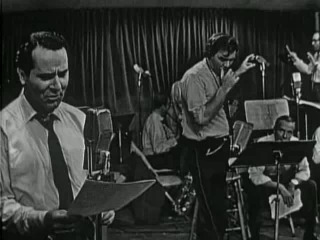 Another radio drama is based on the 1953 movie, and with the same principal actors. You can also read the comic adaptation in Classics Illustrated (1955); one of the classic comic versions. Then there is a 1984 video game based on Jeff Wayne’s musical version – expect neither breathtaking graphics nor perfect surround sound. And there is more. Much more. This episode is best enjoyed perhaps not foremost for its description of Welles’ radio drama and its consequences – as a historical documentary it is sorely lacking. It is much more interesting because it reflects a willingness in society to believe that things are generally much worse than they really are. Many politicians built their careers on this phenomenon, and so to some extent did Orson Welles. In addition, though the technical quality of the available copy leaves something to be desired, the drama is pretty well produced. 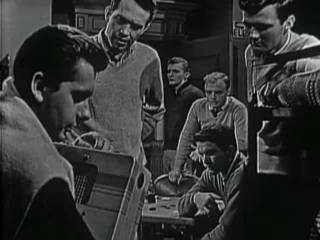 It will hold your attention for an hour’s entertainment, and it is an excellent example of 1950s American television. This entry was posted in Drama and tagged 1950s, 1957, CBS, Documentary, Drama, Fear, H. G. Wells, Halloween, Historical, Internet Archive, Interwar period, Invasion, Made for TV, Mars, Orson Welles, Panic, Radio, Science Fiction, The War of the Worlds. Bookmark the permalink.